Reader Question: How Do I Find My Foundation Color? The best way to test a foundation color is to apply it on the cheek, never the hands like alot of us tend to do. The hands tend to be a little darker then our natural color. When you go and try to find your foundation color, ask the person at the makeup counter to show you your foundation shade. Ask for a sample of the shade that she suggests, and also ask for a sample of a shade that is lighter and a sample of a shade that is darker. Take the three shades home and apply the foundation colors in the morning in natural light. See which color matches the most and looks best for you. The foundation color should look well blended with your neck color. Then go back and ask for that shade. It seems like a hassle, but it so worth your money and time in the long run! It's always best to test the color in natural light not the lights at the makeup counter since they are always going to give you a shade darker then you naturally are. Also, some people tend to get tan in the summer and pale in winter, in that case, you would need two different shades, one for summer and one for winter. If using a liquid foundation, apply the foundation using a sponge. 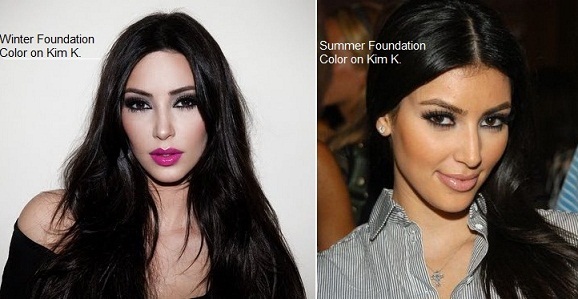 Then set the foundation using a loose powder in a similar color with a foundation brush. If using a mineral based foundation, powder foundation, or a mousse foundation, using a brush is the best method. Hope this helps hon! Good luck!